"I am beside myself," his mom wrote in a heartbreaking Facebook post. "How can people be so cruel?" 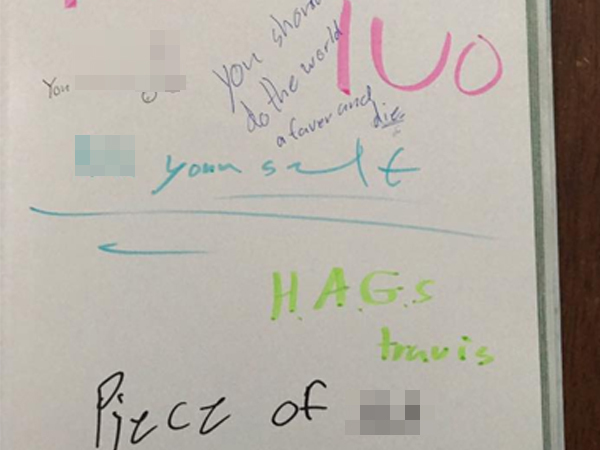 A teenage boy (13) considered killing himself after bullies wrote cruel messages in his yearbook. After seeing the messages, the boy, who went to a school in Washington in the US, sent his mother Shannon Hansen a text message saying, "I’m sorry Mom, I just can’t take it anymore and maybe I should just do it. Maybe they’re right. I’m sorry, I’m sorry." Shannon was shocked at the scribbled notes, which contain foul language and disturbing sketches. She shared a picture of one page in a post on Facebook. 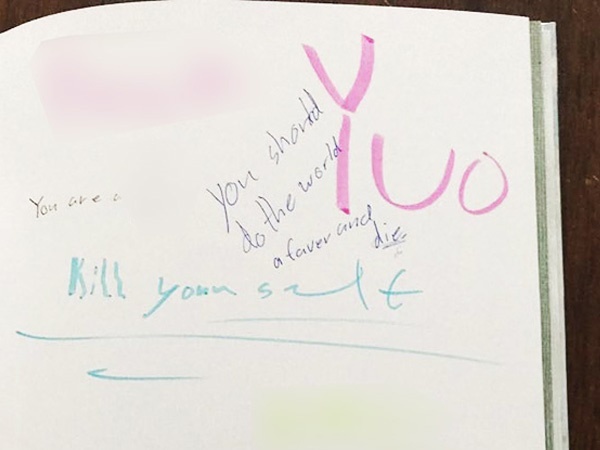 "I am beside myself... how can people be so cruel...my son handed off his yearbook to be signed and this is what he had to see," she captioned the photo. "He walked out of the lunch room and walked home and called me in tears. he has been bullied all year long, I'm sick of it being blown off. I'm Not leaving this school until they figure who wrote these horrific disgusting things." 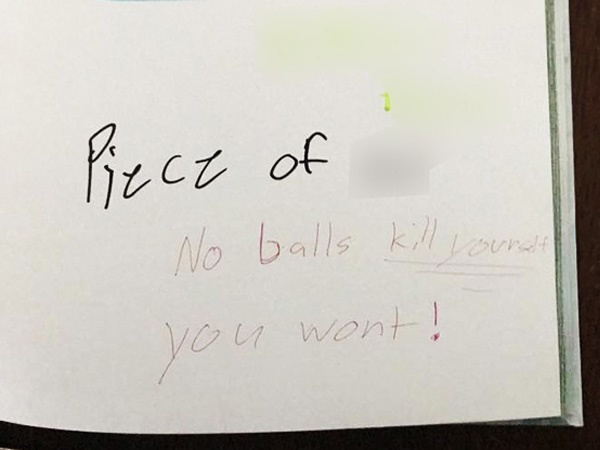 These include phrases like "f *** yuo (sic)", "you are ad *** and" piece of s *** ", and it is also said that the boy did not have enough guts to kill himself. In an interview with KATU news channel, her son said he had started believing what his bullies were saying. Officials of the White River School District expressed concern about the messages. The district superintendent, Janel Keating-Hambly, sent an open letter to parents and the community. Among other things, it said that in 2017-2018 a new subject will be added to the curriculum that will focus on bullying. She encourages parents to talk to their children regularly and to get to know their children's friends better. "Model how to treat others with kindness and respect. Kids learn from adults’ actions. Kids are watching how adults manage stress and conflict, as well as how they treat their friends, colleagues, and families. " HOW DO YOU KNOW THAT YOUR CHILD IS BULLIED? Not all children who are bullied talk about it. Perhaps theY feel helpless or maybe they are too scared to say something. I'm a 45 year old man looking to meet women between the ages of 25 and 38.